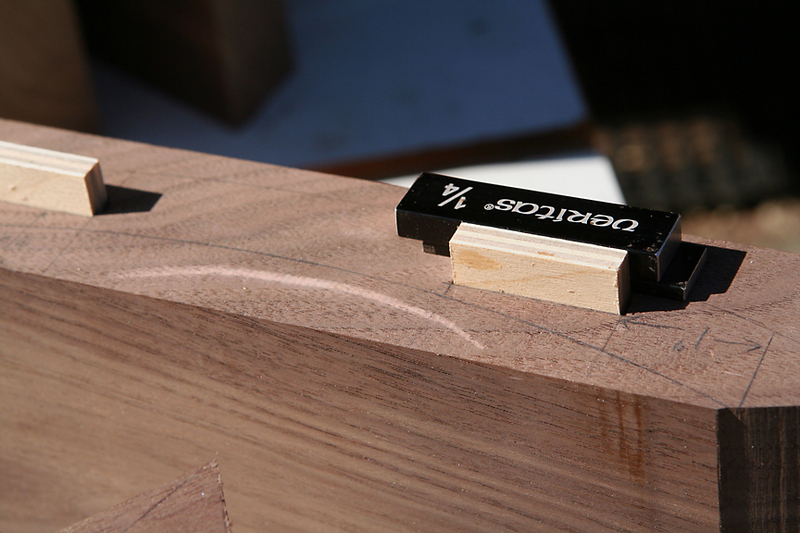 Two loose tenons for each segment. A full-sized drawing of the circle was created in QuarkXPress. Two different (but easily confused) segment shapes make up this build. Examples of each shape were copied from the overall drawing and printed on 10 mil photo stock with the ink jet printer. These were used to mark shaping as well as location of mortises for loose tenons for each segment set. 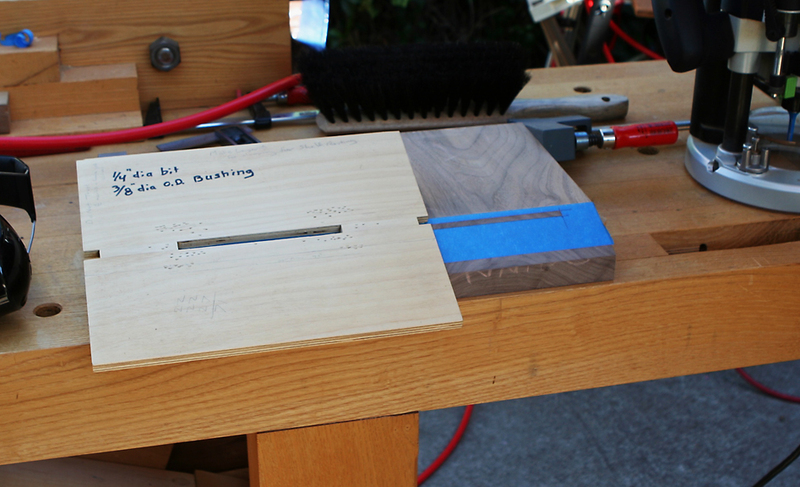 A router with fence cut 1/4 inch deep mortises roughly five inches long. 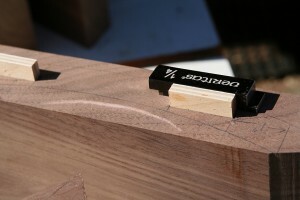 Tenons were made of baltic birch plywood. A dry assembly verified the fit. Bevels were cut at the band saw. 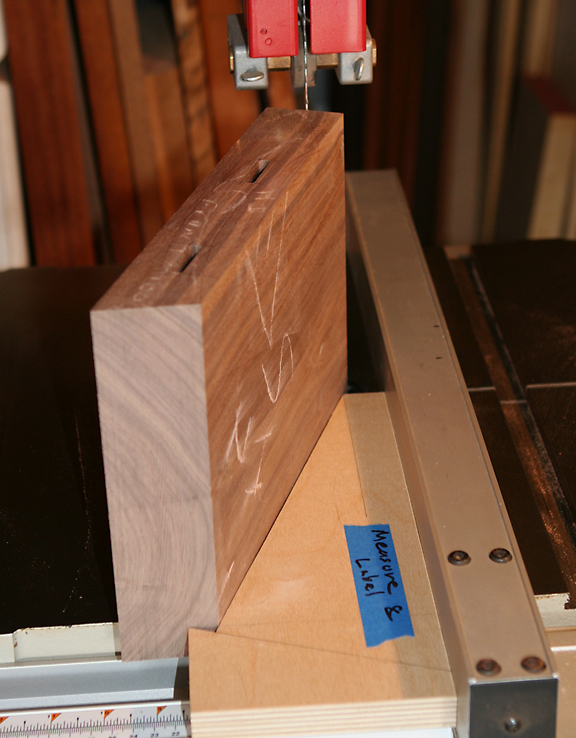 For the 22 degree bevel I used a miter gauge. The 68 degree bevels used a shop-made fence to push the material at the appropriate angle. 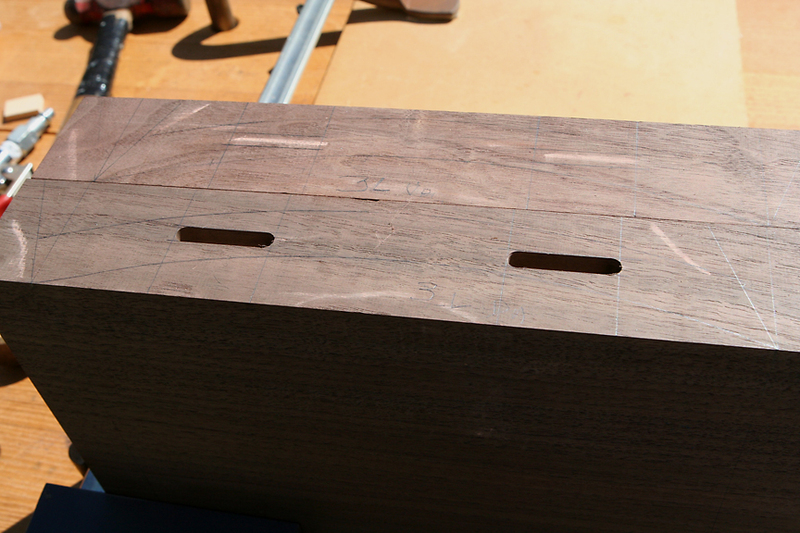 Loose tenons were also used to join the segments to the shelves and spacers (top and bottom). The top and bottom spacers and middle (largest) shelf used tenons that went from one segment through the shelf and into the adjoining segment. 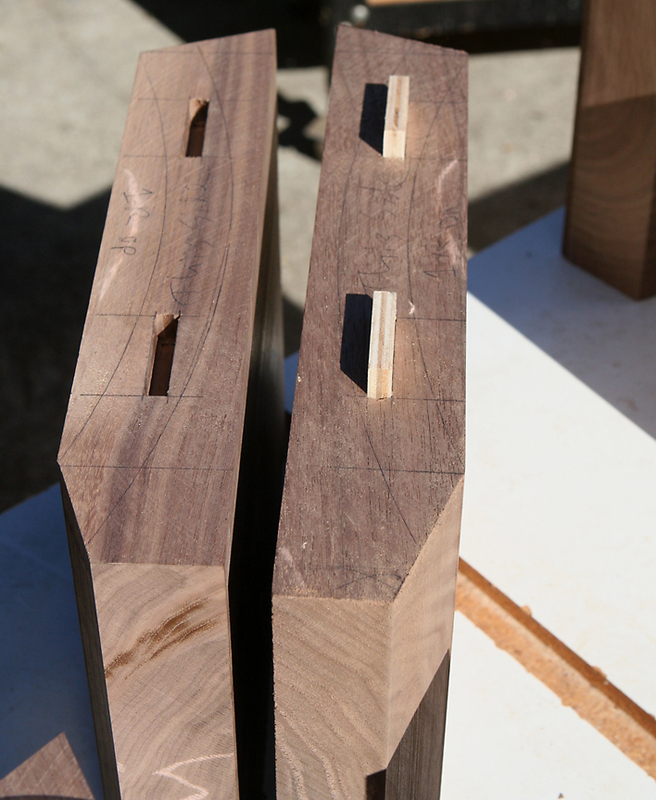 The segments mating to the upper and lower shelves are offset, therefore a tenon went from the segment half way into the shelf. With the opposite side similarly treated. 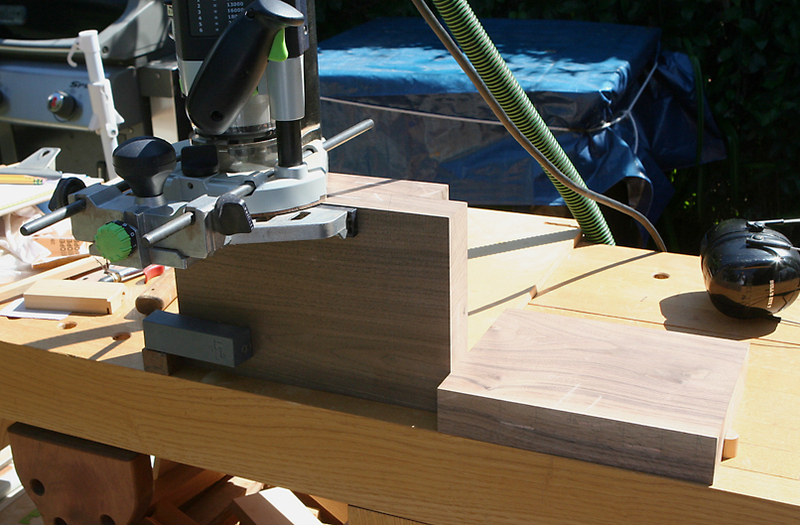 The 22 degree bevels offered a sort of horizontal surface so each segment was pinched between dogs on my bench. Blue tape was used for mark up rather than trying to see pencil lines on walnut. 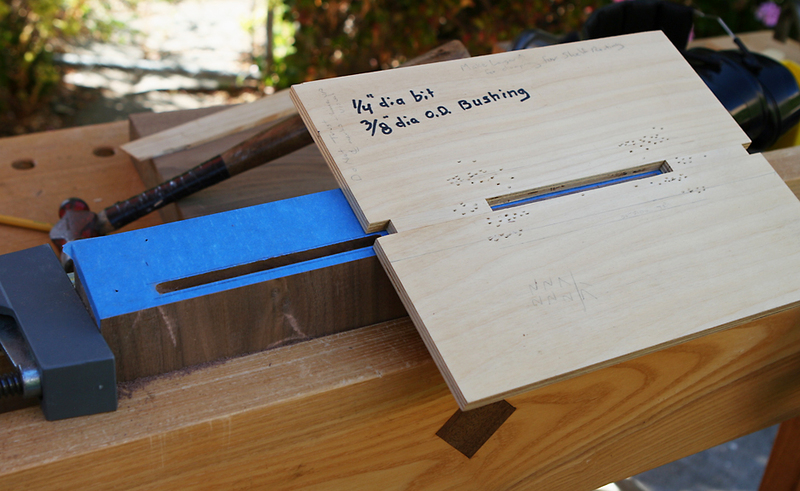 Mortise dimensions were marked and cut out of the blue tape. A template was attached to the segment using 23 gauge brad nails. [I tried double stick tape but that did not feel secure enough for my taste. Also tried clamping in various manners without success.] The brads worked well as long as I positioned them in good places. I had to be careful that the nails would not leave holes in areas that would be exposed once the curves were cut. I was mostly successful in this, but my brain was on break in a couple of instances. 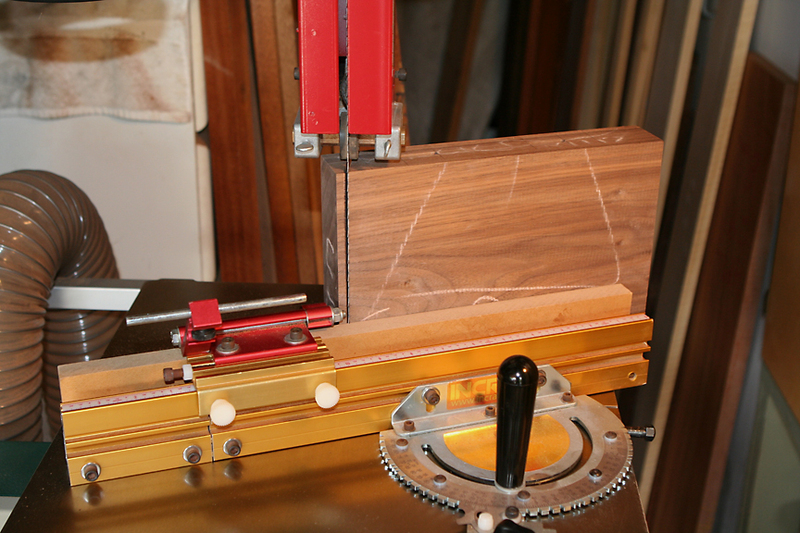 The 68 degree bevel was too steep to use that same procedure, so I placed them upright in the Moxon vise. It worked pretty well, but was not as stable as I’d like. I had to pay close attention to keeping things balanced to avoid rocking. I was pretty successful with that. Mortises are 3/8 inch deep. Next up: very challenging surface clean up.